Located just off Mexico's Yucatan Pennisula, the island of Cozumel has become a popular tourist destination for both cruisers and resort vacationers. With as many as 8 ships in port a day, it is one of the top cruise ship destinations as it boasts beautiful beaches, scuba diving, jungle, Mayan ruins, the city of San Miguel, plus, two-thirds of the island are still undeveloped. Mexico's largest island, 28 miles long and 10 miles wide, has one main road that runs along the southern coast of the inhabited third of the island, plus one road that runs through the middle. It takes about an hour and a half to drive the circuit. 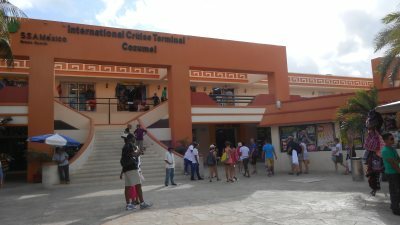 Cozumel's high tourist season runs from November to April and it can bring upwards of 80,000 cruise passengers weekly to Cozumel. Compared to mainland Mexico, Cozumel is quite safe. One local told us that many people choose to raise their children on Cozumel versus the mainland because it is safer and has a more laid back way of life. The locals are very friendly as they realize that tourism pays their bills. As with anywhere, it is still smart to pay attention to your surroundings and not to carry valuables on your person if not necessary. Currency: Pesos, American Dollars - there are ATMs located at the piers which will distribute money in pesos or dollars, but the fees are quite high. Also, the "exchange rate" seems to change depending on the store or restaurant. Always make sure you have small bills for tipping and don't be afraid to barter. 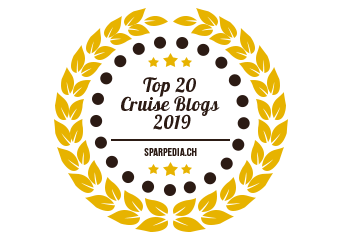 Wireless Internet: Most cafes and restaurants have free wi-fi for their patrons. Just ask for the password. International Pier – 2.5 miles south of San Miguel – you can walk, but taxis are everywhere. If you have mobility issues, it’s a bit of a walk from the ship to the pier stores, but there are locals with wheelchairs that will wheel you for a tip. 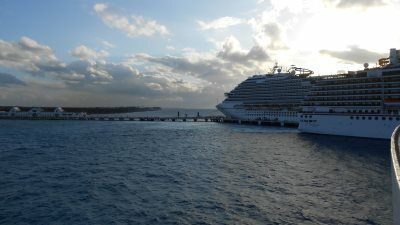 Puerta Maya – Carnival’s pier – 5 miles from San Miguel – you’ll need a taxi to get into town. Punta Langosta – located downtown San Miguel. It’s a short walk to many great shops and restaurants in San Miguel. There is a shopping complex with a Starbucks right at the pier. Taxis are plentiful in Cozumel. Drivers must speak English and it is wise to agree on a fare before getting in the taxi, otherwise the fares are not consistent (we were charged $6 USD to get from International Pier to downtown and $15 to get back from the same spot – our own fault). It’s typically cheaper when you flag down a taxi than hiring one from a taxi stand. Also, taxi drivers may not allow “carpooling” if a few different parties are trying to get to the same spot, and you may have to wait for another taxi. 1) Buy the insurance from the car rental company. US insurance often doesn’t cover both collision & liability in Mexico, and if an accident happens, you may have to pay the cost in cash before leaving the island and then recoup the cost from your insurance company any home. Take pictures of the car and any scratches or dents before leaving the car rental lot to ensure you’re not held liable. 2) Parking is regulated. If you park in a no parking zone, you may end up with a tire lock clamped on your car. Lots and streets have parking meters. 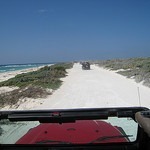 3) There are only 3 gas stations in Cozumel, and none on the far side of the island. 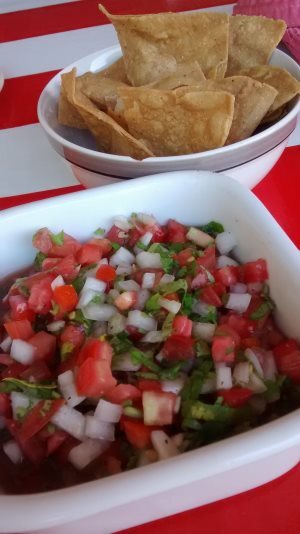 Make sure your tank is full before heading outside of San Miguel. 4) Driving can be a free-for-all. Watch for mopeds and pedestrians. There are many one-way streets that aren’t clearly marked. Take note of which way cars are parked before turning down a street. Streets running North & South have the right of way and streets going East & West must stop at intersections (even if not marked). 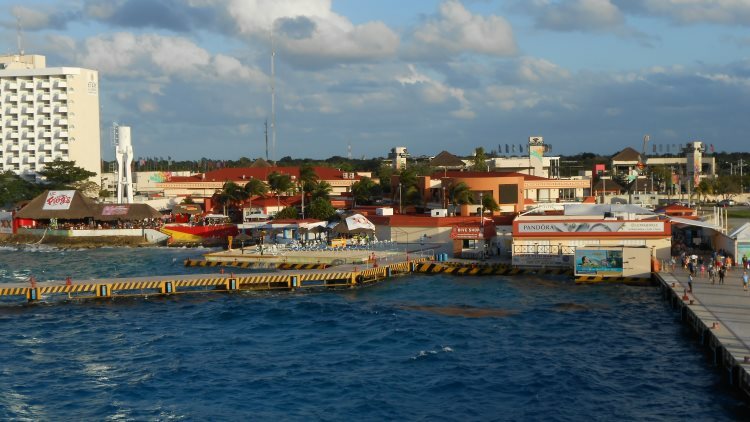 There is a ferry that runs to Mexico’s mainland, to the town of Playa Del Carmen. It’s a 45 minute ride, with the ferries running every hour, but it’s advised to check the schedule. The cost is around $13/adult. The ride is often quite choppy, but day trips to the mainland’s Mayan ruins of Chichen Itza and Tulum are popular with cruise passengers. 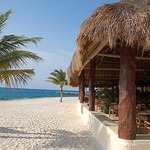 Cozumel is known for its silver (tax-free), vanilla, tequila and Mexican arts and crafts. They also have many pharmacies that see inexpensive over-the-counter medication. Be prepared for every vendor to call to you to come into their store, often with some sort of “promotion.” Bartering is expected so don’t fall for the first bargain you see. Located across the street from International Pier, the Royal Village Shopping Center is a modern mall offering outlets such as Nike, Mont Blanc & Lacoste. Located at the Punta Langosta pier downtown, there are jewelry stores, high quality souvenir shops, clothing stores as well as Senor Frogs, Hard Rock Cafe, Hooters and Starbucks. Near Pancho’s Backyard restaurant, Los Cinco Soles offers quality silver, fashions and unique, handmade Mexican crafts and also has a tequila bar when you’re tired of shopping. The best beaches are located on the west side of the island where the sea is usually much calmer. Make sure you take your sunscreen! Chankanaab Park & Reef – great for scuba diving and snorkeling; Dolphin Discovery Program allows swimming with dolphins for a fee. Nachi Cocom Beach Club – has the beach, swimming pool, water sports, restaurants and bar. Guests often buy all inclusive passes. Mr. Sanchos Beach Club – popular with cruisers, offers all inclusive passes with restaurants and bars, watersports, tequila seminars and other activities. Palancar Reef – part of the Meso-American Barrier Reef – visibility can reach 250 feet in some spots! The majority of the Mayan Ruins are located on the Mexican mainland, but Cozumel has a small site: San Gervasio. Once a ceremonial center for Ixchel, the fertility goddess, it is located about 7 miles from San Miguel. See how tequila is made and get free samples! Hacienda Antigua is a popular, professional tour, for a cost. Casa Mission is a free tour, often where taxi drivers take tourists as part of an island tour. Duration: 2 hours minimum Activity Level: Moderate Note: each chairs & snorkel gear can be rented. Food & drink available at Park restaurant.